All the Cool Kids Are Scorpios!! SCREAMING HAPPY BIRTHDAY to the King of G Funk Mr. Warren G.
This entry was posted in MUSIC, NEWS and tagged Birthday Love, G Funk, happy birthday, Regulate, Scorpio Season, WARREN G, West Coast. This rap battle is one for the history books. Looking for a good laugh today? Well look no further than this!! Check out this rap battle between Method Man and James Corden. James really goes in!!! Now what we are not going to do James, is allow you to use the word Ugly in the same hemisphere with Method Man. But other than that James might have a solid rap career on his hands if he decided to leave TV behind.He’s already got a leg up on these mumble rappers. We hope you had a good laugh and enjoyed this video, we sure did. You can catch more of The Late Show with James Corden weeknights on CBS check your local listings. This entry was posted in MUSIC, VIDEOS and tagged drop the mic, method man, Rap Battle, The Late Show with James Corden, wu-tang clan. It’s been 10 years since one of the most deadliest and devastating hurricanes slammed into the Gulf Coast. Hurricane Katrina claimed the lives of more that two thousand Americans and left city of New Orleans submerged in water. The world watched in disbelief and anger as this disaster was handled with total negligence and disregard for human life by city and government officials alike. 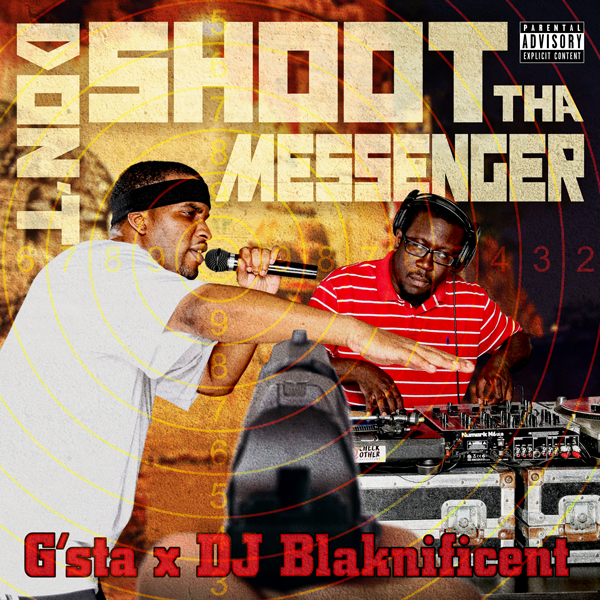 In remembrance and reflection of this tragic time and current social events G’sta, a survivor of Hurricane Katrina, teamed up with long time friend and mentor Blaknifficent for the release of their collaboration “Don’t Shoot Tha Messenger”. With the productivity in high gear G’sta has been making major moves preparing for this release on the 10 year anniversary of Hurricane Katrina. He recently sat down with journalist Matteo Urella at Medium.com for a 4 part in depth interview . You can check out part 1 here. Like New Orleans, G’sta is resilient and focused now more than ever. He continues to push the envelope and grind for his family, his team and his city. Be sure to check out “Don’t Shoot Tha Messenger” available in Apple Music store. Be safe this weekend & remember those who were lost in Hurricane Katrina. This entry was posted in MUSIC, NEWS, SPOTLIGHT and tagged 10 year anniversary, Blaknifficent, Don't Shoot Tha Messenger, G'sta, hurricane katrina, Hurricane Katrina 10 Year Anniversary, New Orleans, NOLA, POTUS, President Obama, Remembering Hurricane Katrina, Right Message, Wrong Messenger.